One of the most demanded assets nowadays is energy. Over many options to generate it, humankind must seek sustainable ways; therefore, renewable energies must be empowered. Moreover, wind provides great benefits, granting uncalculated power at our disposition. Since this task is executed by big structures, their maintenance represents a difficult task for human efforts to achieve, because the height requires much support, effort and time to accomplish. A Remotely Piloted Aircraft System (RPAS) can be adapted to perform surveillance on different types of surfaces, presenting a comfortable way to execute it in dangerous and difficult to access spaces, providing safer methods, and bringing experience of qualified workers and technology together. This paper will provide methods for generating a trajectory over Wind Turbine blades, relying on the specification of a Phantom 4. The main objective is to establish a path over this structure, based on the measurements of a specific model and incorporating all of the blades surface. The results were satisfying once the precision was inside the allowed deviation. Nevertheless, some issues might be improved such as the velocity between waypoints and the polynomial selected to define the trajectory. Antunes, P., Bousson, K. and García-Manrique, J.A. 2018. 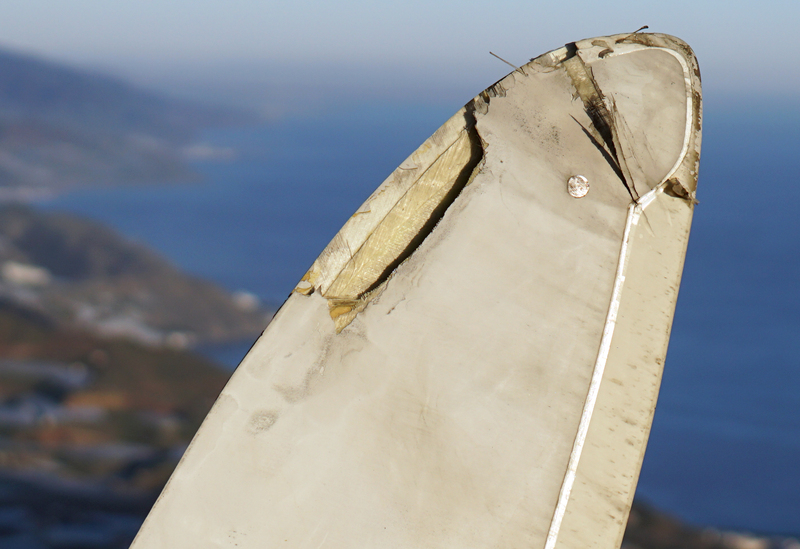 Trajectory control and modelling for wind turbine maintenance by using a RPAS. Aviation. 22, 3 (Nov. 2018), 77-85. DOI:https://doi.org/10.3846/aviation.2018.6124. IRENA. (2012). Wind power. Renewable Energy Technologies: Cost Analysis Series, 1(5), 4-34. Kovacs, M. (2016). Research on the potentiality of using aerial vehicles for monitoring the environment agent - air. Environmental Legislation, Safety Engineering and Disaster Management. Cluj-Napoca. Mellinger, D. W. (2012). Trajectory generation and control for quadrotors. Pennsylvania: University of Pennsylvania. Ziegler, J. G. (1942). Optimum settings for automatic controllers. ASME, 64, 759-768.